KANSAS CITY, Mo. — The Big 12 is the conference of Kansas when it comes to basketball, right? 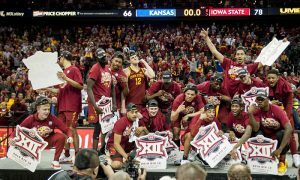 So why does Iowa State keep winning the Big 12 Tournament? This is the question I kept asking myself Saturday night in the Power and Light District in Kansas City, as I watched Iowa State fans party — and I mean PARTY — as the evening of the Big 12 Championship game bled into St. Patrick’s Day. But why doesn’t Iowa State get its due? Like most in the media, I wrang my hands over Kansas’ streak ending — that 14-year streak of regular season championships. That’s a big deal. But, technically all that gets you is a No. 1 seed in your conference tournament and, if you’re one of the smaller conferences, an automatic bid to the NIT if you don’t win your conference tournament. During that 14-year streak the Jayhawks claimed eight Big 12 Tournament titles. And, for eight years, from 2006-13 Kansas and Missouri basically just handed off the Big 12 Tournament title to one another. But since then, since Missouri and Texas A&M bolted for the SEC, the Big 12 went to 10 teams and a double round-robin and “Every Game Matters,” Iowa State has won four of the last six Big 12 Tournament titles. Contemplating that fact, in the moment Saturday night, it occurred to me that Cyclone Nation is used to this. They can hold their liquor, so to speak. So why doesn’t anyone else get that? Kansas State was the No. 1 seed entering the tournament and deservedly so. But the Wildcats had to share the regular-season title with Texas Tech, arguably the league’s hottest team with nine straight wins entering the tournament. Kansas was just sitting there being Kansas and Baylor — which frankly played far above expectations — was the No. 4 seed. Iowa State? The Cyclones sat there, rather innocuously at No. 5. My read on them going into Kansas City? The Cyclones had lost six of their final eight games in the Big 12. My belief was that the Cyclones would probably beat Baylor, but then fall in the semifinals. I figured Iowa State would get Kansas State, and that’s what the bracket delivered. My thought? Defense travels, and Kansas State plays eloquent defense. Iowa State may be the best offensive team in the Big 12, but their defense and rebounding had been suspect going into the Big 12 Tournament. But there was something I forgot. The win over Kansas State featured Iowa State outrebounding the Wildcats 43-29 (Michael Jacobson had a ridiculous 16 rebounds). While Iowa State only forced seven turnovers, they did hold Kansas State to 33 percent shooting for the game. The defense that had been so suspect going into the tournament — you recall these Cyclones gave up 90 points to West Virginia just a couple of weeks ago, right? — was suddenly on point. Same went for Kansas Saturday night. Kansas got off to a horrible start shooting the ball — 27 percent by halftime without a made 3-pointer. The longer shots have been challenging for the Jayhawks this season, but Dedric Lawson, their forward and offensive focal point, had a well-below sub-par night. Much of that in the first half had to do with the defense Jacobson and George Conditt IV played on Lawson. The trick when you’re a team like Iowa State, which is so gifted on offense, is that you don’t have to be an all-world defense to win games. I mean that would be great. But you just have to be functional and effective. For the last three weeks of Big 12 play the Cyclones were neither on defense, at least not consistently. That changed in Kansas City and that, more than Shayok’s clutch 3 or Talen Horton-Tucker’s terrific game in the quarterfinals, led to Iowa State cutting down the nets for the fourth time in six years. Do you know how many other teams in the nation have won their conference tournament four times in that span? Just one. Kentucky, which like Kansas is one of the game’s blue blood programs. Do you know how many times Steve Prohm has led the Cyclones to the Big 12 Tournament title? Twice. 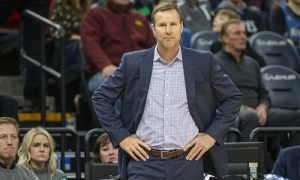 That’s as many as “The Mayor,” Fred Hoiberg, and one more than Larry Eustachy. Do you know how many Big 12 Tournament titles Iowa State has all-time? Five. The only school with more is Kansas (11), and the Jayhawks have only won it twice since 2014. This may not be the year the Cyclones reach the Final Four for the first time since 1944. But a Sweet Sixteen run for the second time since 2016 is certainly possible. The price the Cyclones paid last season for injuries, waiting on Shayok and Jacobson to sit out due to transfer rules and that stellar recruiting class from Chicagoland – which included Horton-Tucker and Tyrese Halliburton — was worth it in the end. Now, instead of Missouri, it’s Iowa State that Kansas must hand the tournament title off to in 2019. Something tells me that isn’t changing for a while. These Cyclones are built to last.